Think galley kitchens are just for restaurants or KP duty? No more! Galley kitchens are catching on at home, with fans loving the sleek and minimalist style they impart. Functional and unique, this style may be the kitchen face lift you've been looking for. 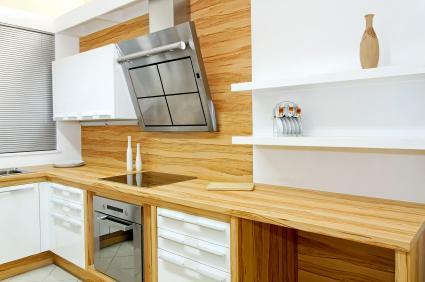 Everyone has heard the term "galley kitchen," but what exactly is it? The dominant feature in a galley kitchen is that all of the unit is connected and run in a continuous row, usually along the walls of the kitchen, although sometimes a galley unit can run the center of the room like an island. The style originally became popular in kitchens and on military bases because they lend themselves to "station" cooking - several people can comfortably work along a galley kitchen counter at a particular station, preparing a specific part of a dish or meal and then pass off to another station without having to walk across the room. This set up makes for an efficient cooking style and cut down on kitchen accidents, since there was no running around with hot pots, sharp knives and the like. Although this style of kitchen design is efficient in a commercial environment, galley kitchens have gained popularity at home as well. People who love to cook enjoy the convenience of the set up, and other people simply enjoy the unique look. Do I Need a Big Kitchen to Go Galley? A common misconception about galley kitchens is that they require a lot of space since it's a style often used in commercial kitchens. As a matter of fact, the whole concept of a galley style kitchen is to conserve space, and they work very well when space is at a premium. Galley style kitchens are used on airplanes and on ships, where there isn't much room to move around. Galleys often use vertical space instead of horizontal space, so they're great if you have a small kitchen. HGTV - This HGTV page will give you a peak at a galley style kitchen as well as advice for maximizing space when your kitchen is small. Galley Design on About.com - If you're a cooking fanatic, you'll like this guide to designing your galley kitchen in a way that maximizes your cooking efficiency. Smart Draw - Smart Draw has handy plans for galley style kitchen if you need to start the remodeling job from scratch.